Hi! I’m Laura Madrigano. 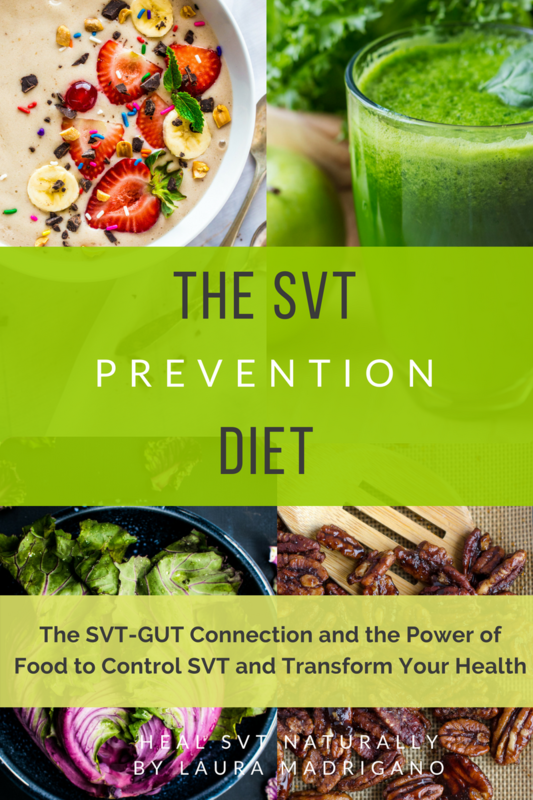 I am a mother of two young boys, a former New York City fashion designer, a Board Certified Life Coach, an Integrative Nutrition Health Coach, a fellow SVT thriver, and the creator of Heal SVT Naturally. My first SVT happened when I was 26 years old. I was working as a Fashion Designer in NYC when I had my first SVT episode. I was stressed out to say the least but was used to pushing myself, working long hours, and putting my personal needs second to the demands of work and my new business venture. Since I had suffered from panic attacks in my early 20’s, I was familiar with the sensation of a racing heart and palpitations. This time it was much different. I couldn’t control my heartbeat with the usual attempts such as slow, deep breathing, drinking water or calming techniques. My breathe and heart felt completely disconnected. A trip to the Emergency Room, and a shot of adenosine confirmed that I had Supra Ventricular Tachycardia. Say what? What on earth is SVT? Needless to say, I felt alone, confused, and scared. Wasn’t I too young for a heart issue? I grew up on guard about feeling ill or getting sick. As a child I had chronic stomach aches and nausea. At age 12, my doctors speculated that I had symptoms for either juvenile rheumatoid arthritis or Lupus, (later re-diagnosed as Lyme). In my late teens and early 20’s I suffered with severe panic attacks that lasted for years. I also had constipation, occasional hives, and headaches. In my 30’s add in migraines, anxiety, adrenal fatigue, gas pain and bloating after eating, low blood sugar, heat intolerance, waking in the middle of the night with a pounding heart, exhaustion, always feeling “off” and POTS. Later I would understand that all of these health issues were directly or indirectly related. All of my symptoms seemed to culminate in my 30’s and after my first pregnancy. The physical exhaustion of giving birth coupled with ongoing adrenal fatigue and the demands of being a new mom wreaked havoc on my body and I just couldn’t bounce back. I woke up every day feeling exhausted and afraid. I never felt rested no matter how much I slept or like I had the energy to take care of my son. I felt depressed, unhappy, sick and constantly as though I was going to have an SVT. They no longer seemed “once in a while” or out of the blue, but I felt symptoms of one “coming on” nearly every day. I longed to be able to figure out what was wrong with me and began searching for answers at various doctor appointments. I made appointments with leading cardiologists and electro physiologists in premier New York hospitals to educate myself and to get opinions about treatment and prevention of SVT. I wore holter monitors and took every kind of blood test, all of which came back “normal”. I became more than frustrated to say the least as I lived with constant palpitations, electrical misfires of the heart, SVT “attempts”, actual SVT or the crippling fear of one occurring. One morning after eating a cheesesteak sandwich the night before, I woke up not feeling well. As usual I didnt have a bowel movement, I felt foggy, as though I was either hung over or just not “right” as per usual. That day, I experienced a long and difficult SVT that made me question my survival. I intuitively knew that if I didn’t figure out and control my health problems, that I was in serious trouble. And thus, the most important journey of my life would begin. Like a detective, I began to study and track my symptoms. I had to cover all of my bases including food, water intake, bowel movements, feelings, and activities and consider everything a potential clue as to why I was so sick in general, and what was causing my SVT specifically. There must be a reason why I had random SVT episodes, and more that I could be doing to help myself. I began to draw connections, such as links between FOOD + SVT, Lack of Sleep and an increased likelihood of SVT and more! I seemed much more likely to get an SVT when I was hot, or had sugar for breakfast or got run down. While I understood that I had an accessory pathway allowing the SVT to occur, I wondered why they appeared to happen on certain days, or when I was sleep-deprived, stressed or constipated? Were SVT’s really random or were they linked to food and self-care? The only advice I consistently received from my cardiologist was to avoid caffeine. I knew that my doctors were well-intentioned and provided me with their best advice. Yet, I really questioned the lack of practical information available that I could use to help myself. If caffeine was to be avoided, then wouldn’t there be a long list of other foods that could help or hurt my SVT symptoms? Why weren’t my doctors as fascinated as I was about my links between a lack of a bowel movement and the increased chance of an SVT or lack of sleep and SVT? I knew there had to be more I could do to help myself. Food and self-care became my focus. I remained determined to figure out all the contributing factors that provoked my SVT. Even though I had a lifelong interest in holistic health, and was fairly educated on the subject, I knew there was a lot of work to be done with my food, nutrition and self-care. I needed the expertise of people with a similar way of viewing health to help me. I employed a health coach, a naturopathic doctor, an acupuncturist and other alternative health practitioners to look at my symptoms in a whole new, whole body way. Some of the first steps were layering in quality supplements, testing for food sensitivities and changing my diet to avoid what was making me sick (such as gluten + sugar). I worked on gut healing as well as adding in more nutrient-dense foods. I also had to address old emotional issues and lifestyle habits that were self-destructive like my lack of self-care, and healing my old emotional wounds from the past. I also had to make tough decisions and face personal issues that were causing ongoing stress, and learn how to manage my stress in intentional and productive ways. I embraced self-care as if my life depended on it! I tracked my trials and errors, and progress, as well as my decision to decline medication and ablation, on a blog I started called Heal SVT Naturally. It was a place for me to vent my frustration and my success, and to share stories with others who had SVT. I wasn’t sure where it would lead me, but I trusted that it was an important step in my journey. That little blog has turned into a valuable website and leading resource on the internet for people who are searching for alternative approaches to healing SVT, just like I was! Over the years this website and the community have evolved, and so too has my health and my life dramatically improved. My POTS is gone, healed, non-existent. I don’t have any SVT-related symptoms anymore, such as palpitations or chronic electrical misfires, or actual episodes. I never wake up with my heart pounding in the middle of the night, and my heat intolerance is gone. I can lift my children without worry of triggering an SVT and never get postural triggered SVT anymore. My general anxiety, panic attacks, exhaustion and blood sugar fluctuations are also gone and I have lost weight as a bonus. In short, I am finally forging the path of living life to the fullest and without the constant fear of an SVT occurrence. You really can change your health using natural remedies as your tools to do so! Because self-care, health, spirituality, and food became the things I focused on in order to transform my life and health, I changed careers to allow the things I valued to be in the forefront of my life everyday. I became a Board Certified Life Coach and later an Integrative Nutrition Health Coach. 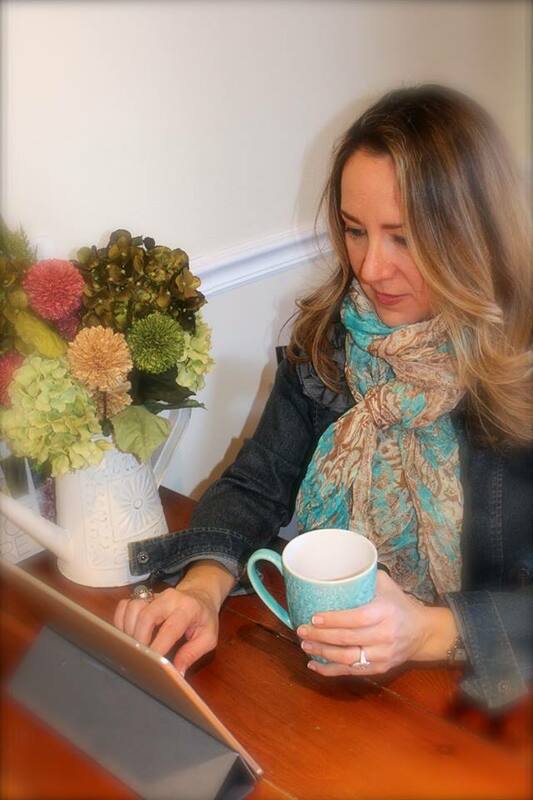 Today, I write, coach, and create healing resources for people with SVT from all around the world to use to transform their lives and health just as I have. 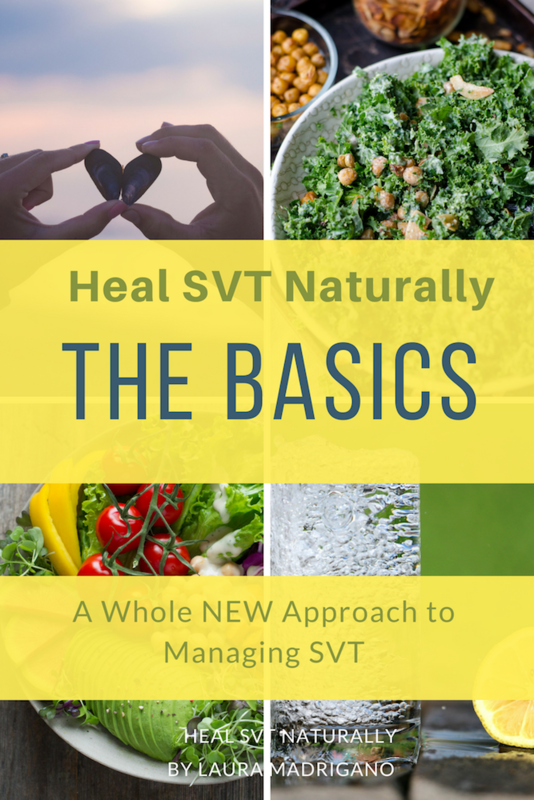 Are you ready to heal your SVT naturally? Healing SVT naturally is not magic. It takes an open mind to seek testing for food sensitivities and changing your diet. It requires commitment to embrace self-care, to address emotional wounds and to listen to your heart in new ways. To be successful in this healing, it helps to view this diagnosis as an opportunity to take your health and happiness to a whole new level. So prepare to do some work on yourself, but know that you will be completely supported. I KNOW that you are being called forward for big things, just like I was, and that you need to feel better to be able to reach your greatest potential. You don’t have to suffer or live in fear of SVT! There is a better path and I want to help you discover and embrace it. 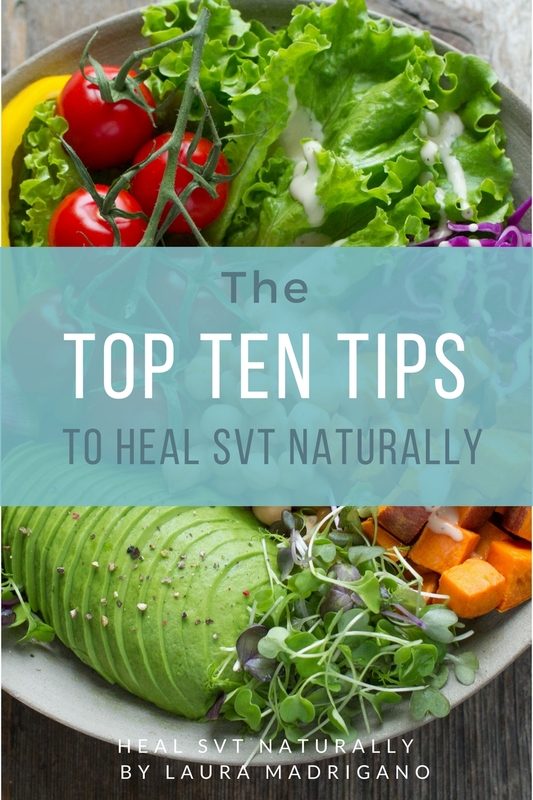 Sign up for my SVT newsletter and receive my free 13 page e-guide called the TOP TEN TIPS to heal SVT naturally. 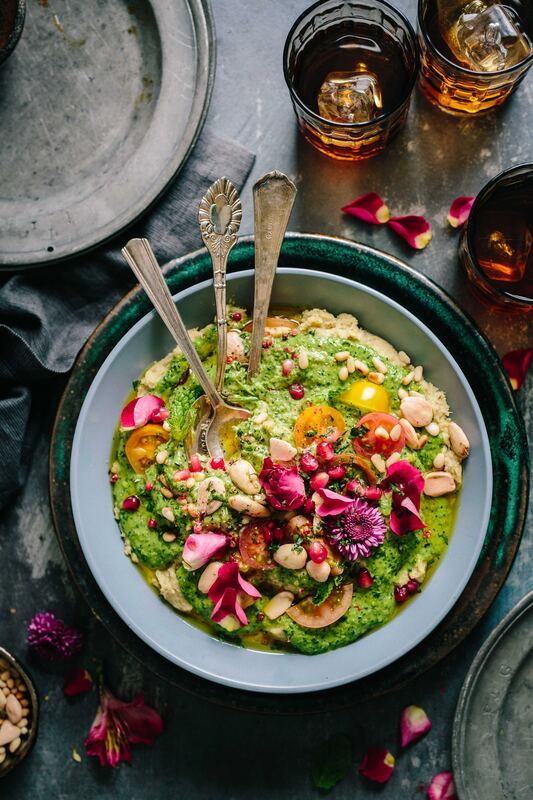 You will also get my monthly newsletter, recipes, self-care tips, and special notes from me to help inspire and support you!